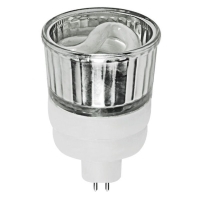 The 9 watt MR16 compact fluorescent reflector from Overdrive has two GU5.3 pins at the base. This bulb plugs into a GU5.3 fixture. The light produces 230 lumens of light, at 4100K allowing it to be a suitable replacement for a 35 watt halogen cool white lamp. It cannot be used with dimmers, and should be recycled once the bulb has reached the end of its life.